That's pretty great if you ask me, the idea that we're stealing time from television. For most of you, Khoi Vinh needs no introduction. The user experience designer, writer, and speaker is a leading voice on design, technology, and culture. 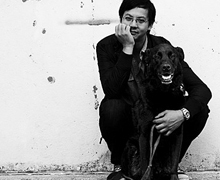 Khoi has presented innovative ideas on his widely read blog, Subtraction.com, for more than 10 years. In the summer of 2010, he left his position as design director of NYTimes.com a few weeks before his daughter turned one-year old. Needless to say, we were honored when Khoi agreed to answer a few questions for us. We can’t wait to share the entire interview in our publication, but for now, we’ll share some highlights. We asked him about risk. He said, “I’m thankful for every failure I’ve had because they’ve all led me to this point. Your failures are as useful as your successes, really. The biggest risk in my career so far was starting Mixel, hands down.” Mixel, which launched in November 2011, is a social art-making tool for people who don’t think of themselves as artists. Built to encourage people to create without inhibition, Mixel allows its users to create collages from photos and share them on its beautiful social interface. Mixel empowers people to create and we think that is wonderful. We realized the power of Mixel’s mission when Khoi described how users spend their time with the app. He said, “Users say they sit down on their couch with Mixel in the evening and all of the sudden it’s 30, 60, or 90 minutes later. They get started creating, and lose themselves in the process. Mixel engages a part of the brain—the part that lets one be creative without inhibition—that many people haven’t exercised since they were kids. To spend 90 minutes doing this is pretty wonderful, because that’s time that many people would otherwise be consuming, rather than creating. That’s pretty great if you ask me, the idea that we’re stealing time from television.” Kern and Burn fully supports anything that encourages people to make things with their time. Be sure to check out Mixel, Khoi’s blog, and stay tuned for Khoi’s designer-focused business advice. In the meantime, trade in an hour or two of consumption today and make something new.